For that matter, you've probably been wondering where the heck has Phillip Johnny Bob been lately too. Well, without too much ado......they are alive and well, and just finished helping Grandma J trim her tree. Phill was a tad jealous that Crusty was able to jump right up on the tree and frolick and loligag around to his heart's delight.....so Grandma J let Phil use her computer chair to gain better access. They had a blast decorating, but Crusty as having a bit more fun thatn Phil. 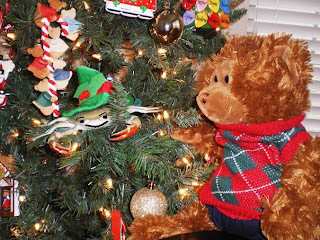 He loves teasing Phil with a pinch of his claws every so often...then scamper up the branches out of reach. One like this! 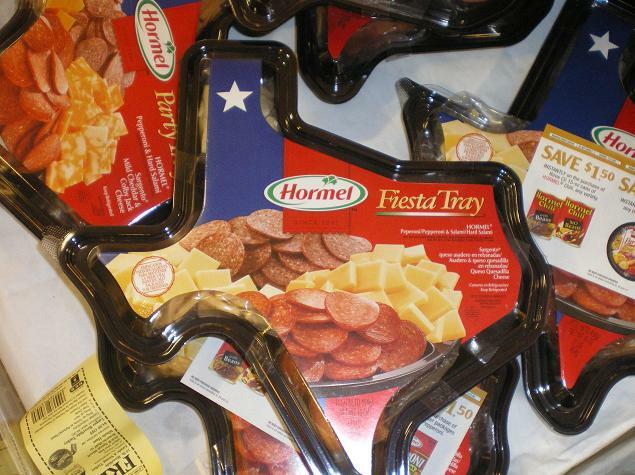 Does Hormel make party trays shaped like your state? This is yet one more Texas thing that makes Grandma J laugh. ...only in Texas;) And I love PJB's holiday outfit! Texas does it up right! I could go for one of those party trays! Did I ever tell you GJ that I was born in Texas? Yep it's true! And it is so good to see the critters! 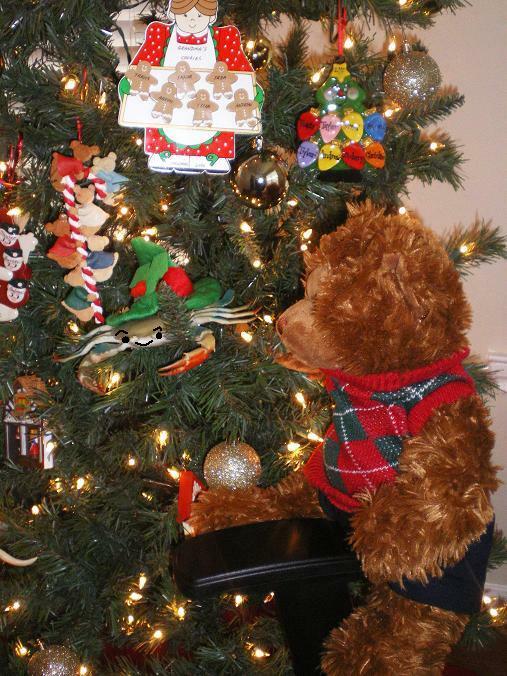 You all did a wondferful job decorating the tree! I am still working on mine! 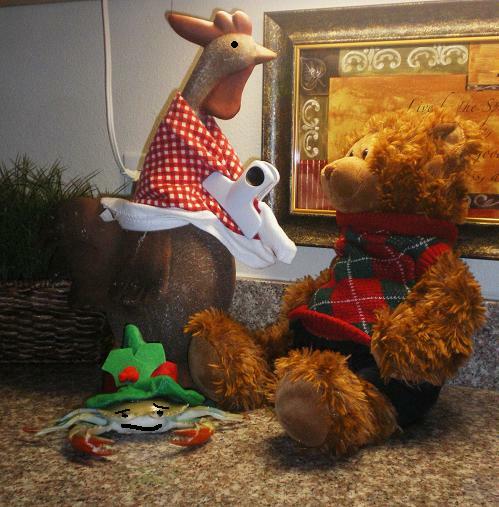 Look how festive Crusty is! And PJB. Also, I love Margaret's outfit. Is that a chip clip holding her shawl together? We do not have sausage trays shaped like the state of Virginia here. I'm jealous. 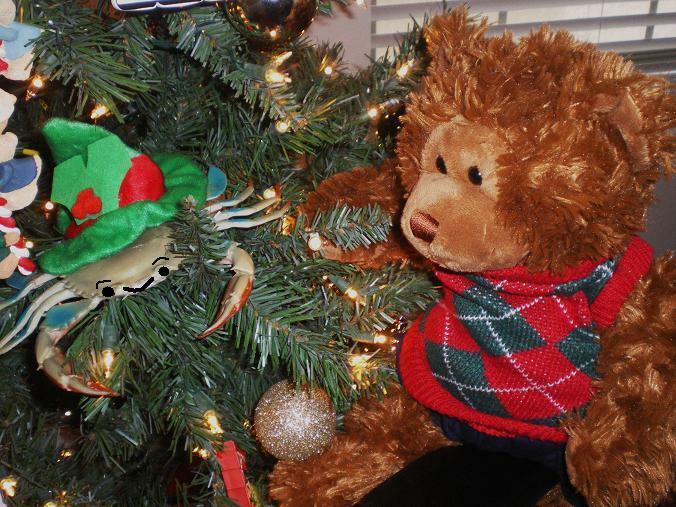 You bring shame to crabs across America by making Crusty were an elf hat! Does Margaret have a chip clip holding her blouse up? 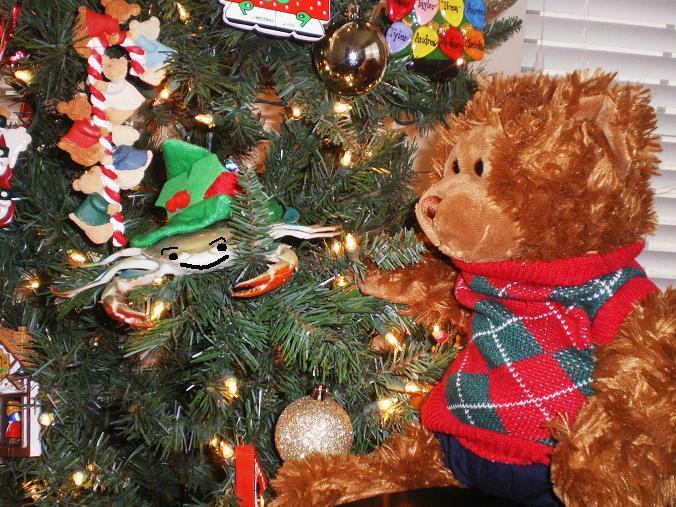 So happy you have the kids, I mean the creatures helping with the tree...and no fighting? Awesome! I think the coolest states have that : ) So only yours! : ) How funny! Shaped like Texas? That's classic. Does anyone but you actually believe that these guys are ALIVE and well? ? ? You are so funny, GJ! Always a party at your house! No Michigan shaped treats are sold anywhere in the world. Something about the Upper Peninsula breaking off which, for the record, would be absolutely fine with me. I believe the only type of ham we can get in the shape of VA is a Smithfield!! !